A video still shows Buena Regional High School wrestler Andrew Johnson getting his hair cut on Dec. 19, in Buena, N.J., after referee Alan Maloney told Johnson he would forfeit the match if he did not have his dreadlocks cut. A week after a white referee told a black high school wrestler that he needed to cut off his dreadlocks or forfeit a match, the referee has been suspended. But people in town — and on social media — are asking why other adults didn't do more to prevent what happened: A school official cut the student's hair as the crowd watched and the clock ticked down. 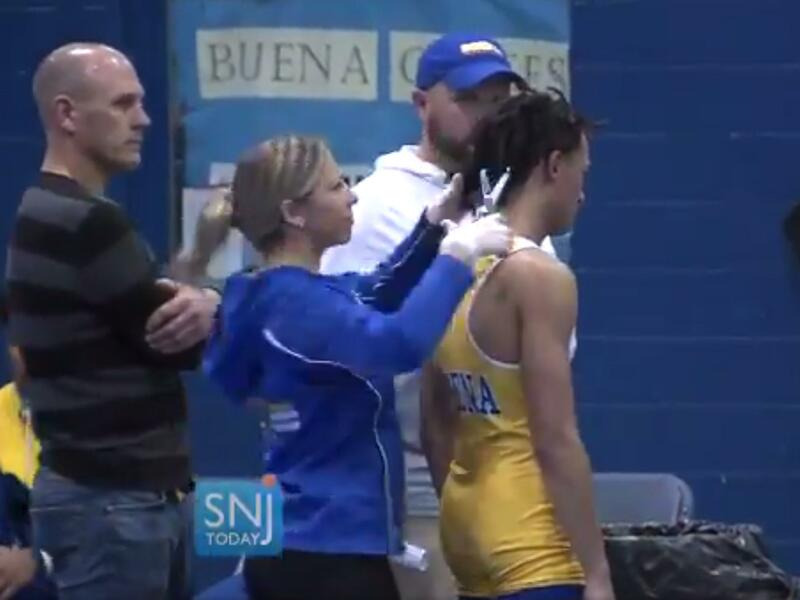 In a video that has been viewed millions of times, Buena Regional High School junior Andrew Johnson is seen having his hair cut by the team trainer. Johnson won the match in overtime. But as the referee, Alan Maloney, raised Johnson's hand as the winner, the young man looks utterly miserable. A local sports reporter tweeted video of the incident, and outrage followed. "This is not about hair. This is about race," tweeted the ACLU of New Jersey. "How many different ways will people try to exclude Black people from public life without having to declare their bigotry? We're so sorry this happened to you, Andrew. This was discrimination, and it's not okay." The New Jersey State Interscholastic Athletic Association said in a statement that it had suspended Maloney while the incident is investigated by the New Jersey Division on Civil Rights. Athletic association Executive Director Larry White said the incident had hit close to home: "[A]s an African-American and parent — as well as a former educator, coach, official and athlete — I clearly understand the issues at play, and probably better than most. The NJSIAA takes this matter very seriously, and I ask that everyone respect the investigatory process related to all parties involved." It turns out that it's not the first time that Maloney has been investigated on charges of racist conduct. At a party in 2016, he allegedly called a black referee the N-word. Maloney told the South Jersey Courier-Post that he didn't remember using the slur, but he believed the accounts of witnesses who said he did. The New Jersey Wrestling Officials Association initially decreed that Maloney would be suspended for a year, but he filed an appeal. The association's ethics committee overturned the suspension, ruling that it didn't have jurisdiction. Johnson's family released a statement through its attorney, Dominic Speziali, that offered a more detailed accounting of what it says happened at the Dec. 19 match. Referee Maloney was reportedly late to the meet and missed weigh-ins when "scholastic wrestling rules clearly state that referees are to inspect wrestlers' appearance and determine any rules violations prior to the start of the meet, typically during weigh-ins. ... When he did evaluate Andrew, he failed to raise any issues with the length of his hair or the need to wear a head covering." Maloney rejected the covering that Johnson wore over his hair, and then started the clock, giving the wrestler 90 seconds to cut his hair or forfeit the match. The family says, "Under duress but without any influence from the coaching staff or the athletic trainer, Andrew decided to have his hair cut rather than forfeit the match." The family added that it is supportive of Buena's coaches and trainer: "The blame here rests primarily with the referee and those that permitted him to continue in that role despite clear evidence of what should be a disqualifying race-related transgression." "Rajhon White, a Buena alum, said the fact that the adults in the gym let that haircut happen reflects a larger problem with the culture of the community.
" 'It's not surprising,' said Alison Arne of Buena Vista. 'It was shocking to see Andrew Johnson's hair being cut, but it definitely was not shocking that it was allowed to happen.' "
The state's department of education tweeted that it had met with the NJSIAA on Thursday morning "about protecting the rights of all student-athletes across New Jersey." The episode brought Johnson tweets of support from Olympic gold-medal-winning wrestler Jordan Burroughs and film director Ava DuVernay, among others. "I don't just wear locs. They are a part of me. A gift to me. They mean something to me," DuVernay wrote. "So to watch this young man's ordeal, wrecked me." Burroughs called the incident "sickening." "I've been wrestling for 25 years, at every level, and I have never once seen a person required to cut their hair during a match," he wrote. "My opinion is that this was a combination of an abuse of power, racism, and just plain negligence. As heroic as it was for Andrew to step up in the midst of what was happening, it shouldn't have got that far. The parents and coaches of the Buena wrestling team should have intervened. This young man should have been protected in this moment. I'm sure his hair was a strong part of his identity, and no single victory is worth succumbing to the pressure of unjust oppression and the unwarranted stripping of that identity." Johnson's parents said the family had been moved by the outpouring of support, and that wrestling has taught their son resilience against adversity. "As we move forward, we are comforted by both the strength of Andrew's character and the support he's received from the community," they wrote. "We will do all that we can to make sure that no student-athlete is forced to endure what Andrew experienced."